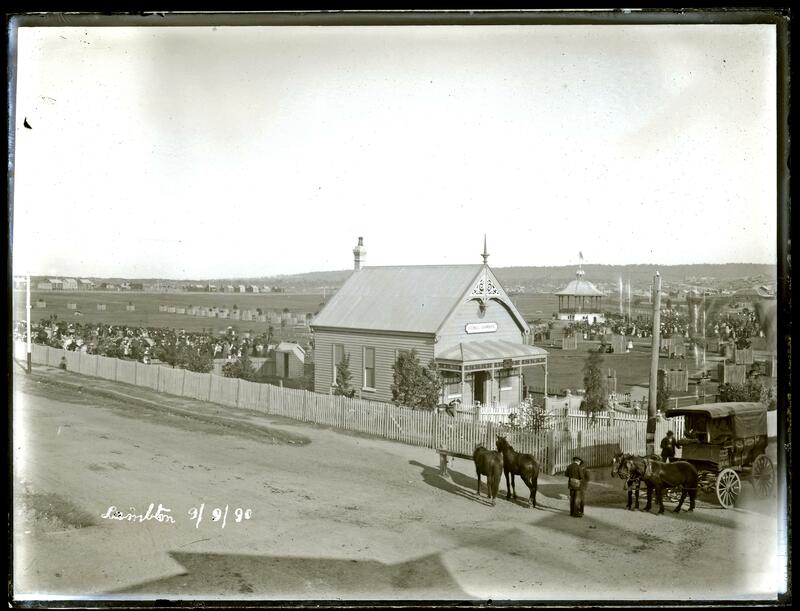 Lambton Council was incorporated on 26 June 1871. In the period June 1871 to March 1938, Lambton Council met at the following locations. 15 Aug 1871 Mr Stoker’s long room, Gold Miners’ Arms Hotel, corner of Elder and Grainger St.
25 Aug 1871 – Nov 1873 Joseph Phippin’s residence, corner of Dickson and Grainger St.
11 Jul 1876 – 1887 Mr Maddock’s building, above the Telegraph office, Elder St.
21 Jul 1887 – 29 Mar 1938 Council chambers in Lambton Park, corner of Morehead and Elder St. The ballot to elect the first aldermen took place on 7 August 1871, in the Mechanics’ Institute building on Howe St. The long six windowed building in the foreground is the first Mechanics’ Institute building, in Howe St, Lambton. circa 1884. University of Newcastle, Cultural Collections. At 7 o’clock a large number of gentlemen, consisting of the amalgamated successful and unsuccessful candidates and their guests, sat down in the long room of the Gold Miners’ Home Hotel, to a substantial supper provided by host Stoker. Mr Stoker’s “long room” was a large hall on the upper floor of the “Gold Miners’ Arms” hotel, on the north east corner of Elder and Grainger Streets. The second council meeting was held in this location on 15 August 1871. Stoker’s Hotel. Photo by Ralph Snowball. University of Newcastle Cultural Collections. … succeeded in renting a room in Dixon-street, Lambton, from Mr. Joseph Piper, 34 x 12½ feet, at a rental of 5s. per week. … in Mr. Joseph Phippen’s dwelling-house, and subsequently in two other dwelling houses, and for years in a room over the dwelling of the late Mr. W. Maddock, in Elder-street. The Corporation have finished Grainger-street up to Mr. Stoker’s hotel. It is to be hoped they will finish it up as far as the Council Chambers. The location of Phippin’s residence being on the corner of Dickson and Grainger streets is confirmed in advertisements in 1879 when Phippin opened a Temperance Hotel on the site. 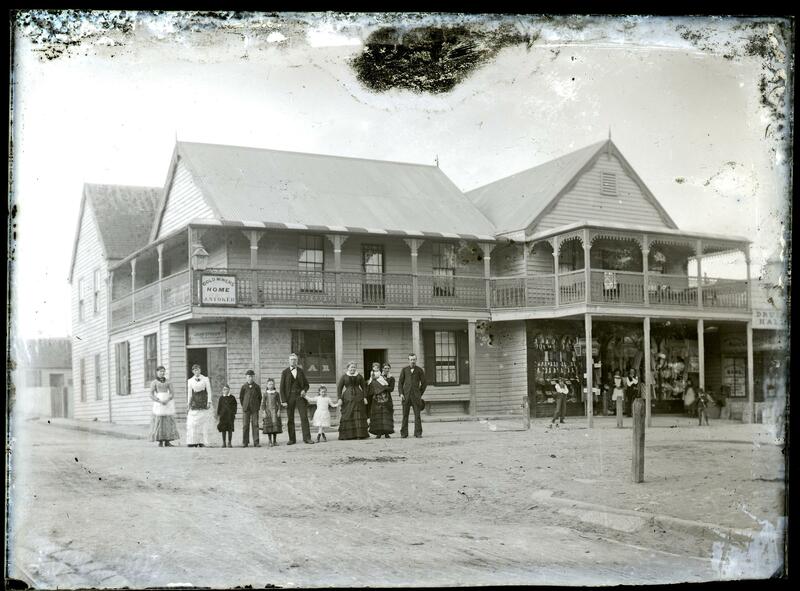 Patronage of his temperance establishment must have been meagre, for just six months later, on 13 March 1880 Phippin announced the opening of the Northern Star Hotel on the site “with a choice stock of the best brands of Liquors, Ales, etc.”. 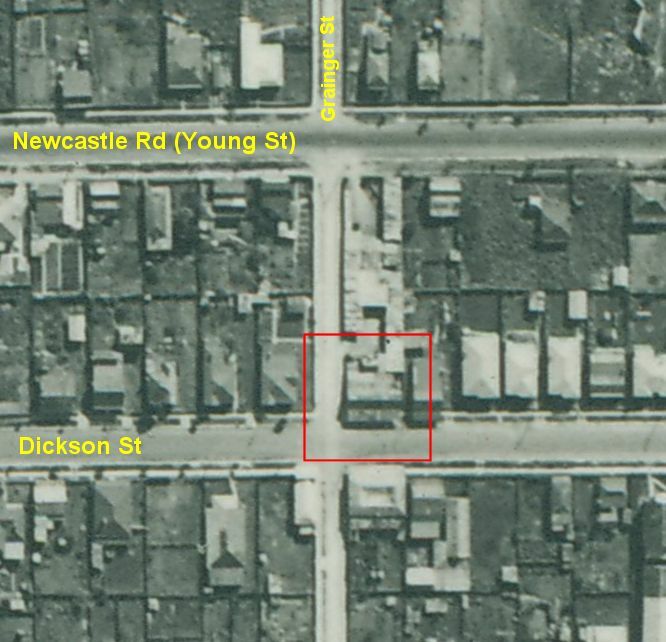 The former Northern Star Hotel building in a 1944 aerial photograph. The building was used as a corner store from 1902 until about 1989, when it was sold and demolished, and a residential house built on the block. 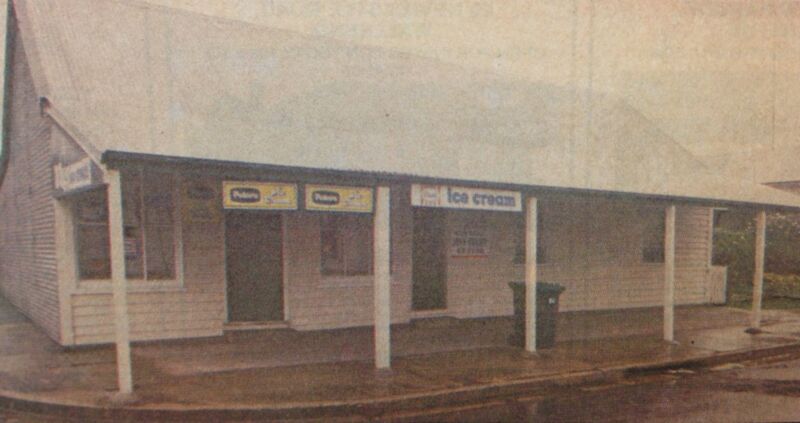 The former Northern Star Hotel building in 1989. The site in May 2017. The Mayor was of opinion that it was time the Council was looking out for more suitable premises, as the present building was nothing but a pile of old paper and rags, and totally unfit for their purposes. The shift to Mr. Maddock’s premises (above the Telegraph Office) occurred on 28 June 1876. In the previous council meeting on 27 June 1876 the Mayor “read a memorandum of agreement between the Council and Mr. W. Jenkins, for the renting of premises in Elder street, for Council Chambers, for a term of two years. Either the building was owned by Mr Maddock and leased to Mr Jenkins, who then sub-leased the upstairs to the Council, or the building was owned by Mr Jenkins who then leased downstairs to Maddock and upstairs to the Council. 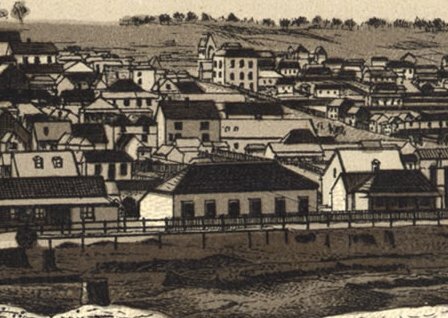 In January 1872 the Council had applied to the Minister for Lands for a parcel of land at the eastern end of Dickson Street to erect municipal chambers. The request was granted and the Council estimated the probable cost of the chambers to be £200. Limited finances however meant that construction did not proceed, and the council continued to meet in rented premises. The Dickson Street site was eventually resumed by the government in 1884 to be used for the police barracks and lockup. The council was still meeting in Maddock’s builing in March 1881, and in the absence of any evidence of a subsequent move, it can only be presumed that council continued to meet there until they erected their own chambers in 1887. “That plan and specification be prepared for a wooden building suitable for council-chambers, cost not to exceed £200.” He thought the time had arrived when they should have a better place of meeting. The present one was unsuitable and uncomfortable, and for the sake of the ratepayers and themselves they shouldhave a better one. Alderman DENT seconded, and supported Alderman Kerr. The present building was a beastly place. When they looked around they saw the very walls in mourning, whether for the sins of the aldermen he knew not. He was favourable to a new building, and erecting it on the corner of the reserve facing Morehead street. 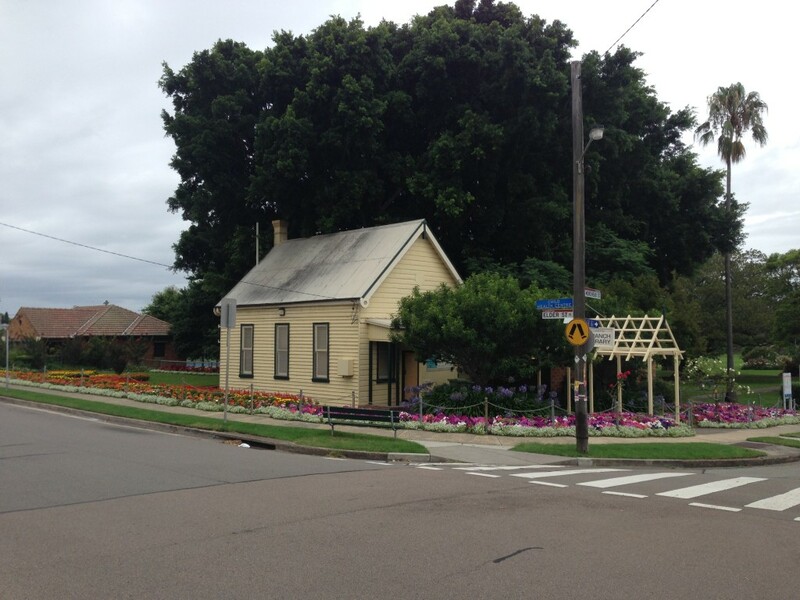 In a few short months a weatherboard building for the council chambers was constructed on Morehead and Elder Streets, in the corner of Lambton Park. The building cost £270 and was formally opened on 21 July 1887. Lambton Council Chambers. 9th September 1890. Photo by Ralph Snowball, University of Newcastle, Cultural Collections. In 1892 the government gazetted a parcel of land as a site for a town hall. The site was a block of land on the north side of Elder St, which was split – the western half reserved for a town hall, and the new Mechanics’ Institute was built on the eastern half in 1894. The map below from 1906 shows the “Town Hall” site on the left on block 856, and the Mechanics’ Institute on the right on block 330. Note how the non-consecutive numbering gives a clue that the block was subdivided. Unsurprisingly, given the bankruptcy of the council over the electric lighting scheme and its continuing financial indebtedness, there was never any possibility of building a new town hall. In 1910 there was some discussion in council about using the Elder St block of land for a public pound. In 1926 the town hall site was re-gazetted as a council depot and storage area. With the creation of the Greater Newcastle Council in 1938, the final meeting of Lambton Council took place on 29 March 1938. Lambton Council Chambers. Newcastle Morning Herald, 21 May 1938. … that permission had been granted for the use of Lambton Council Chambers as a recreation hall for soldiers. It was decided to name the hall as “The Lambton Citizens All Services Recreation Hall. The building became the Lambton branch library in February 1950, and continues to be used for this purpose to the present day. Lambton Branch Library, in the former council chambers. December 2014. 26 Jun 1871 Incorporation of Lambton Municipality. A supplement to the Gazette, issued on the 26th June, notifies the constitution of a municipality under the name and style of the "Municipal District of Lambton," and defines the area included therein. 29 Jul 1871 Nomination of candidates for the first Lambton council election. Thomas Croudace at the top of the list. 2 Aug 1871 Nominees for the first election of alderman in Lambton address a public meeting. Thomas Croudace appears to have withdrawn as a candidate by this date. 7 Aug 1871 First election of aldermen for Lambton Council, held in the Mechanics' Institute building on Howe St.
8 Aug 1871 Official declaration of the poll of the first election. 8 Aug 1871 First meeting of Lambton Council, immediately following the declaration of the poll, where Uriah Broom is elected by the alderman as Mayor. 8 Aug 1871 Inaugural supper of Lambton Council, following the declaration of successful candidates and election of the first Mayor. 15 Aug 1871 Second meeting of Lambton Council, held in Mr. Stoker's long room. 25 Aug 1871 Lambton Council's third meeting, now in "the new Council chambers, Dixon-street, Lambton." 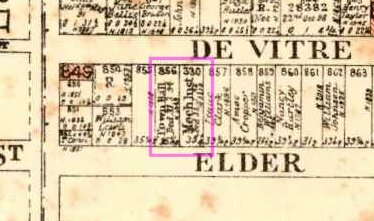 26 Aug 1871 "The aldermen have succeeded in renting a room in Dixon-street, Lambton, from Mr. Joseph Piper, 34 x 12½ feet, at a rental of 5s. per week." 26 Jan 1872 Lambton Council sends a Letter to the Minister for Lands, "applying for land near the proposed extension of Dixon street, for Municipal Council Chambers." 26 Mar 1872 Council estimates £200 for cost of constructing council chambers. 30 Aug 1873 Correspondence tabled at Lambton Council meeting … "Letter from Mr. Phiphen, landlord of the Council Chambers, giving the Council notice to quit the premises now occupied." 8 Nov 1873 After 20th November 1873, "the Municipal Council Chambers will be REMOVED from Dixon-street to Mr. R. Jones's premises, in Elder-street." 24 Feb 1874 At a Lambton Council meeting ... "Alderman Grant moved, 'That the sum of £150 be placed on the estimates for the erection of a building to be used as Council Chambers.' Alderman Screen seconded, and the motion was put and carried. " 11 Aug 1874 At Lambton Council meeting … "Letter read from the Lands Department advising the Council that they had been made trustees for the land at Lambton, dedicated as a site for the Municipal Chambers." 30 Nov 1875 "The Council Chambers were composed of such inflamable material that in the event of a fire taking place it would be impossible to save any of the property." "The Mayor was of opinion that it was time the Council was looking out for more suitable premises, as the present building was nothing but a pile of old paper and rags, and totally unfit for their purposes." 29 Jun 1876 Lambton Council have shifted their quarters to Mr Maddock's new building above the Telegraph Office. 19 Sep 1876 Letter from Mr. R Jones, "claiming the sum of £3 10s. 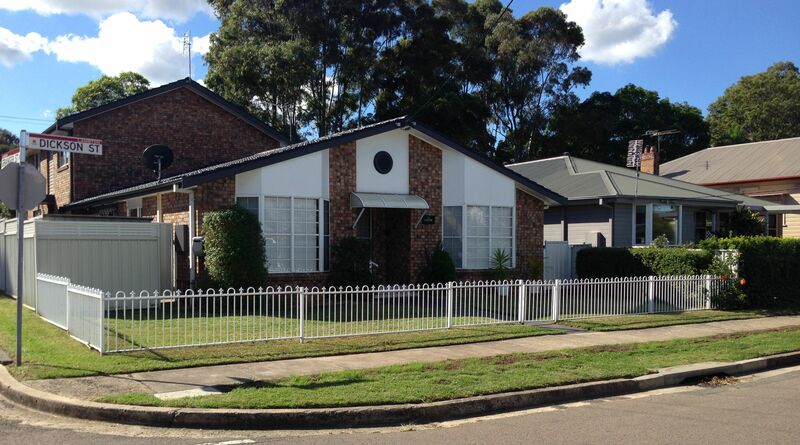 as rent for the premises lately used as the Council Chambers." 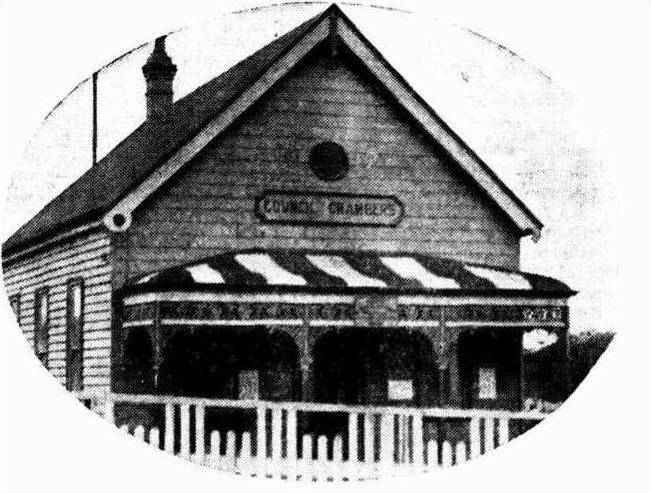 21 Jul 1887 New council chambers on the corner of Morehead and Elder streets formally opened. 7 Jul 1892 Council offers half the block of land set aside for a town hall on Elder St, for the Mechanics' Institute to erect a new building. 7 Jul 1926 Council to ask Lands Department to "re-gazette the the land vested in the council in Elder-street, so that same could be used as a depot for metal, and to erect a building for storage purposes. " 29 Mar 1938 Final council meeting. 21 Nov 1940 Regarding the council depot in Elder St adjacent to the Mechanics' Institute, "permission is being given by the department for the removal of an iron garage and a weatherboard storeroom. The land will then be made available to the department for disposal in two blocks." 1 Feb 1950 Former Lambton council chambers opened as a branch of Newcastle library.